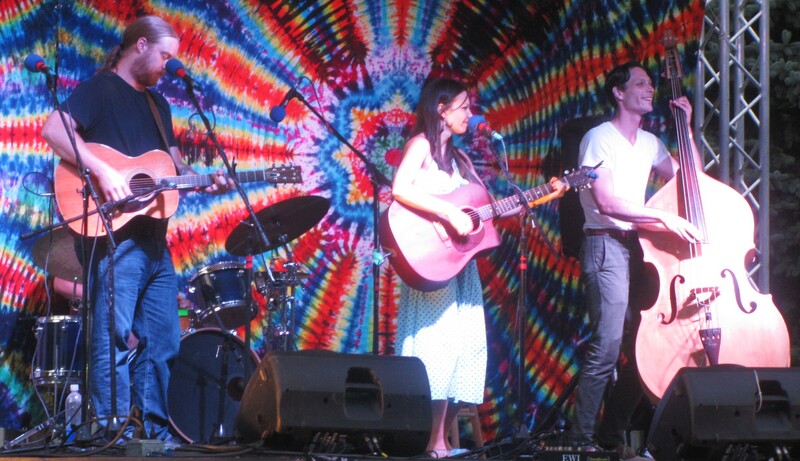 2013 FreshGrass Award winners RUNA delighted the Cornstock audience with two shows on Aug. 30. Soulful vocals and earnest picking made instant fans out of many of those in attendance. 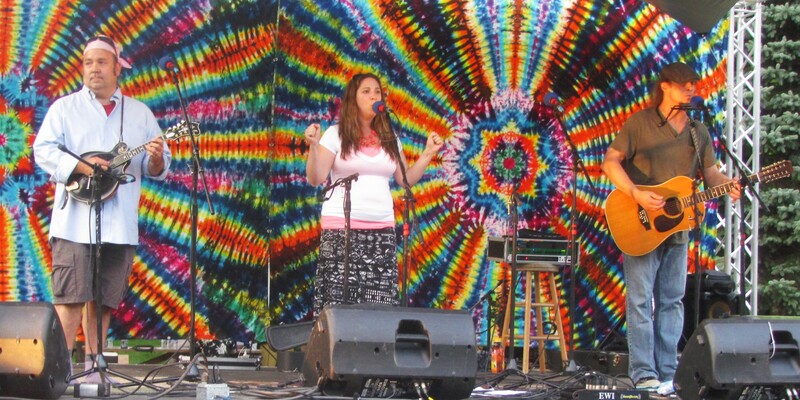 The colors on the tie-die backdrop continuously changed when the night-lighting came on. With attendance nearly doubling from its 2012 inauguration to its sophomore year, Cornstock Folk Festival, held Aug. 29 to 31 proved that popular folk music can hold its own even with a county fair less than 15 minutes away hosting country music stars. The two genres have forever flirted with and bounced off each other, but their simultaneous success during the recent Labor Day Weekend hinted at the potential for an even stronger pairing in the future. 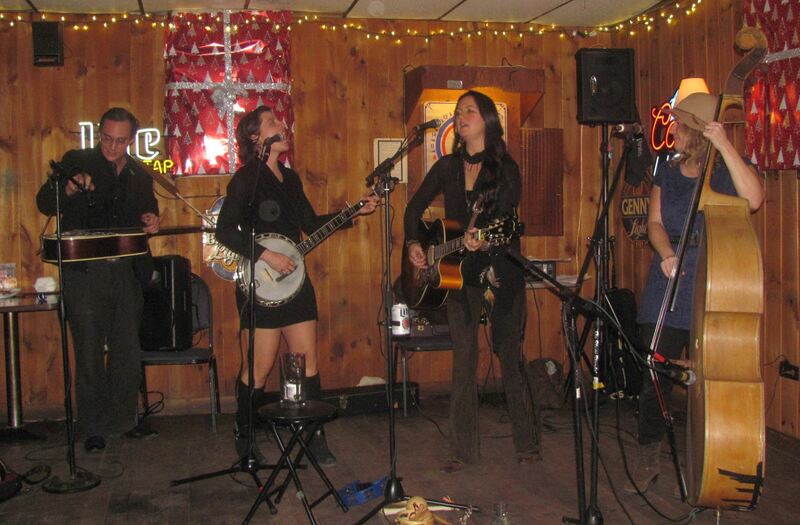 At the two-year mark, Cornstock is obviously still in the experimental stage, but coordinators Anthony and Jillian Hannigan have a great role model – NEPA Bluegrass. Marking its 10th anniversary this past year, the world-class blurgrass festival orchestrated by Danny and Christa Stewart has, most importantly, demonstrated just how accomodating Tunkhannock’s Lazy Brook Park is for such events. The Hannigans surely never set out to Duplicate NEPA Bluegrass. To the contrary, Jillian noted in an interview with me recently that she and Anthony were striving to do something decidedly different, though the blueprint of the Stewart’s event and the way the park is utilized is certainly a handy template for any music festivals that follow. I missed the first Cornstock, but it is my understanding that the playbill was largely comprised of the Hannigans’ many talented family members and friends. Not only did most of them return to the delight of returning and new patrons, a full year of social networking (and another hugely successful bluegrass festival) attracted nationally-known acts to Cornstock this year and literally set the stage for a festival with lasting legitimacy. While at least half the musicians appearing at Cornstock this year would probably refer to themselves as bluegrass artists, it was clear from the start that experimentation was not only permitted, it was encouraged. The Bog Swing Group used traditional bluegrass instruments to create their own brand of ragtime jazz. While not reinventing the wheel, their reeling repertoire sounded as fresh as the morning dew. Without a doubt, the best thing that I can say about Cornstock over and over again is that I was blown away by the caliber of the music. I smiled, I relaxed, I danced, I sang, and I laughed for two days straight. Sometimes, the music was so damned awesome that I literally got goose bumps. The food was nearly as fantastic. Albeit moderately priced, most of the offerings were fresh and made to order. It was easy to eat healthy, which can’t be said about typical carnival fare. I can certainly see Cornstock growing, perhaps doubling in size again in 2015. There’s plenty of room yet for more acts at the pavilion along Tunkhannock Creek, referred to during NEPA Bluegrass as the “alternative stage.” I’d personally like to hear some acoustic folk rock back by the creek during the day to balance out the traditional bluegrass and perhaps some headliners doing experimental material. I can also see Cornstock attracting acts from other parts of PA where bluegrass and folk have been strong for years, such as York and Lancaster Counties. Check out The Vinegar Creek Constituency who are just wrapping up their first tour of Ireland. I’ve also heard from a bunch of people in Bradford and Susquehanna counties that I should go see Driftwood, who are from the Binghamton area. An increase in attendance will also surely bring about improvements in logistics. There were plenty of hygiene stations and port-o-potties, but the placement could be better. The bank of port-o-potties closest to the main stage were randomly labeled and dark the first night. The second night, someone put glow sticks inside each of them which was a great idea. I found it ironic how you don’t notice the sound of the doors slamming shut all day, but you sure do hear them in the dead of night. Camping for the weekend is a great option. We’re so glad that we took the tent and cots. Though we drove home each day to feed the cats and process garden produce that we didn’t want to lose, there was a great sense of comfort in knowing that we could enjoy adult beverages along with the music each evening and not have to drive through or around Tunkhannock to get home. Nonetheless, I have some advice for future Cornstock campers and a suggestion that the available campsites be mapped out in the future with areas reserved for those who know that they are more likely to retire early and those who intend to party until morning. Though we slept well the first night, on Sunday morning we ended up stuffing our hastily collapsed tent and our gear into the truck at 6 am because a group of people camping on the road above us was not only still awake but playing a radio and using profanity loudly with no signs of quitting. We felt so bad for the father, mother and little daughter in the camper next to us who probably spent as much time at their campsite as anyplace else at the festival. There was no reason for them to be subjected to that nonsense. Next year, we will select a campsite as close to the food court and main stage as possible. Not only does the party end there at 11 pm, I’m guessing that a lot of vendors head to bed early to prepare for the next morning. Yes, I’m being a little picky. It was a great event, but there’s always room for improvement somewhere. I’d be remiss not to mention anything. Most importantly, Cornstock enjoyed a growth spurt in the supposed shadow of the Wyoming County Fair, where popular upstart acts Parmalee and the Swon Brothers also drew sizable crowds to the region. It seems to me that the Endless Mountains could be on the verge of being a Mecca for fans of folk, country, bluegrass, and roots music on Labor Day weekend. Local bars also proved that they weren’t intimidated by the larger events by simultaneously booking local country and folk artists. I heard that local country act Them Boys drew a great crowd to The Office in Nicholson that Saturday night, despite being just 10 minutes away from Corsntock. 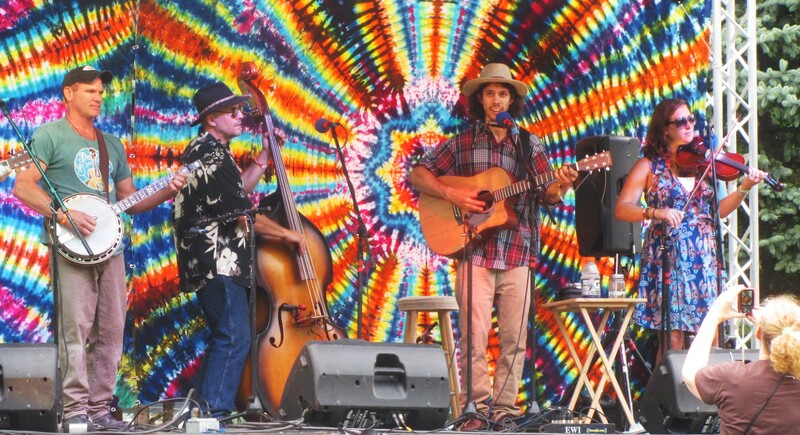 I say “Viva la Mountain Music.” We’ve already got an inherently strong fan base for folk music, and we’re sitting on a hotbed of roots music and country talent at a time when all eyes are already upon us because of natural gas. Shouldn’t we make hay while the sun is shining There is a great potential to bring many thousands of music fans to the area each year via these two big vehicles. Cornstock has planted the seeds. We can all help it grow. Joined by numerous friends from other bands on stage, David Brown (second from right) served up a humorous plater of bluegrass ditties during the dinner hour. Perfect weather and incredible live music allowed patrons to settle in and relax at the main stage area. Not everybody could stay seated however. 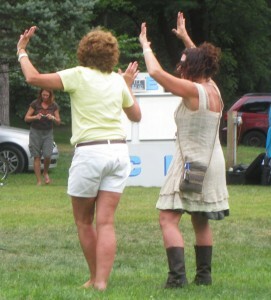 Many people were moved to dance by the offerings at Cornstock. Dani Mari & Friends took the crowd through sunset. Kris & Julie Kerr (right) got some help on stage from long-time friend and event coordinator Anthony Hannigan. 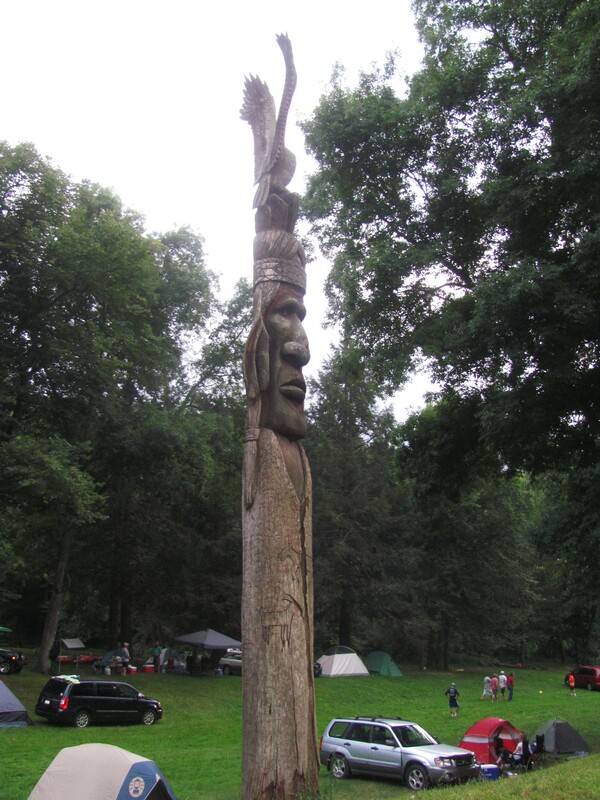 One of several tree carvings throughout Lazy Brook Park. 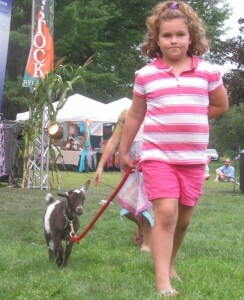 Mary had a little goat, and he happily trotted along with her through Lazy Brook Park.